The annual Parker Lee Foundation Guest Bartending and Holiday Bash took place at Fado Irish Pub on Friday, December 22 and was not only its usual great time, it was a PLF record breaker. An all-time high $4500 was raised at the event for this year's honoree, Kevin Schindler. Kevin, a long-time PBR10K attendee and Ohio Wesleyan baseball great from 2009-2012, is suffering from Grade 4 Glioblastoma which is a type of brain tumor. A great crowd made it out for the fun as approximately 75 friends, family and OWU teammates were in attendance. A few acted as the guest bartenders (some even poured the pints of Guinness correctly) but most served as guest beer drinkers. 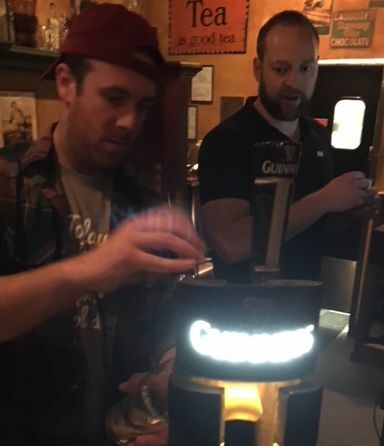 In addition to the guest bartending, plenty of great silent auction and raffle items were for the taking as well as complementary Christmas gift wrapping and pint glass engraving provided by Guinness. 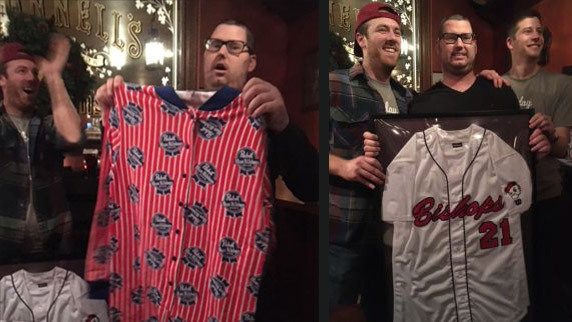 The night was capped off with Kevin receiving his #21 Ohio Wesleyan jersey framed from his teammates as well as a PBR onesie from the Parker Lee Foundation. Everyone needs a PBR onesie right?